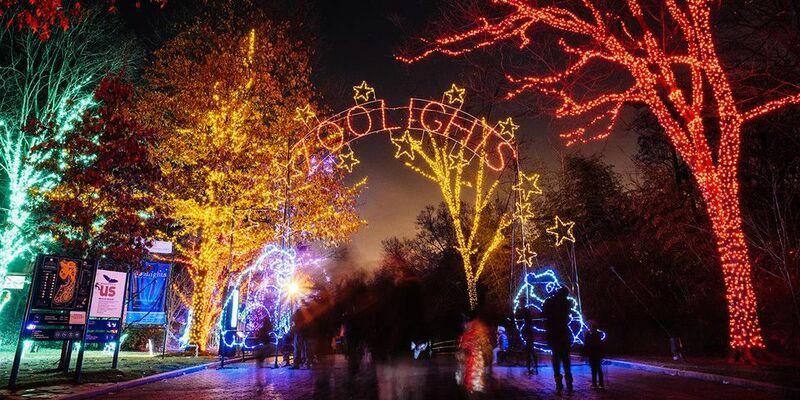 Celebrate the holiday season with a drive or a stroll through one of the Washington, D.C. area's spectacle of lights at a local park or along the water in Washington, D.C., Maryland or Virginia. These Christmas light displays are beautiful and a great way to share the magic and joy of a winter wonderland. Don't miss the FREE annual boat parades along the Potomac River (Alexandria and Downtown Washington DC) and the Chesapeake Bay (Annapolis). 9900 Stoneybrook Dr., Kensington, Maryland. (301) 587-0144. November 29-December 31, 2018. Dusk to 10 p.m. nightly. FREE Admission. View more than 450,000 lights and a live outdoor Nativity scene each evening from 6 to 9 p.m. Live musical performances begin at 7 and 8 p.m.
2018 times and dates to be announced. Winter Lights is a magical Christmas light display including more than 350 illuminated displays and along a 3.5-mile drive through the park. See Photos of Winter Lights at Seneca Creek. Symphony Woods, Merriweather Post Pavilion, Columbia, Maryland. (410) 740-7840. November 22, 2018-December 30, 2018. Symphony of Lights is a spectacular drive-through display of more than 75 animated and stationary holiday lights. All proceeds from the Symphony of Lights benefit the services of Howard County General Hospital. Annapolis Christmas Lights Boat Parade, Annapolis City Harbor (410) 267-9549. December 8, 2018, 6-8 p.m. Enjoy a parade of lights when more than 70 power and sailboats show off their holiday decorations. Free event. 7700 Bull Run Dr., Centreville, Virginia. (703) 359-4633. November 21, 2018 through January 6, 2019. Hours: Monday - Thursday & Sunday: 5:30 to 9:30 p.m., Fridays, Saturdays & holidays: 5:30 to 10 p.m. This festive display of lights features penguins, snowmen, deer, candy canes and Santa. Monday – Thursday, $20 per car, Friday – Sunday, $25 per car. The event will include more than 40,000 animated lights set to music! After viewing the lights you can visit the new Winter Wonderland Holiday Village that includes amusement rides, an ice skating rink, entertainment, shopping, contests, food, and more. See Photos of the Bull Run Christmas Lights. 9750 Meadowlark Gardens Court, Vienna, Virginia. (703) 255-3631. November 9, 2018-January 6, 2019, 5:30 to 10 p.m. Admission: $14 Adults, $8 children ages 3-12. The garden offers a half-mile walking tour of lights featuring unique animated displays with a nature theme and a Gingerbread Village. After visiting the display, step inside the Visitor Center to warm up with some light refreshments.